Since 2002 the CRI Post-Secondary Summer Internship Program has worked to raise student awareness of coral reef issues, threats, and the efforts underway to protect them. Participants are provided with opportunities to gain hands-on experience in resource management as well as outreach, and are encouraged to pursue an education and career in an aspect of coral reef resource management. Though coordinated by Coastal Resources Management Office, interns are also paired with partner agencies such as the Division of Fish and Wildlife, and local coral reef focused NGOs. Students are selected through an interview process and placed with a mentor at Division of Coastal Resources Management Office, Division of Environmental Quality, Micronesia Islands Nature Alliance, and the National Oceanic Atmospheric Administration. 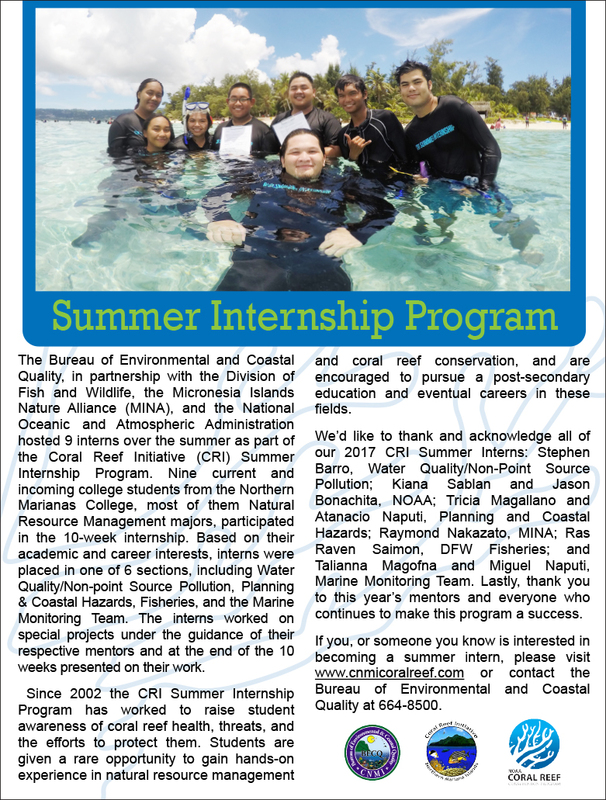 Each intern is assigned to a CNMI-specific coral reef management project, participates in the Marine Monitoring, writes a news article, and presents a written report and an oral presentation within the 10-week period. Since 2002 over 100 students have participated int he program. Visit this page to learn more about past CRI internships.